This summer has been pretty great. We became aunt/uncle for the first time and the girls got to meet their first cousin, we had a great family vacation with the De Jongs, we have one coming up with my family soon as well, and we painted our kitchen/hallway/bathroom cabinets (which wasn't the most fun at the time, but so glad it's done!). In between those things, we've had lots of fun enjoying this summer with just playing outside and going to the park. Slow mornings at the park are my favorite. I had a mom tell me that she really missed mornings at the park now because her boys are older, and I know I will miss them when my girls are older too. It's the best to watch my girls have fun and to just enjoy the weather and being together. I am also treasuring this summer because it's so different from last summer. Last summer, Lucy and Ellory were still quite small, definitely not sleeping as well as they are now, and on a strict feeding schedule too. It was good in it's own way because it was a formative year for our family (and newborn snuggles are great), but it was also pretty hard in lots of ways. I felt torn between Norah and Lucy/Ellory, like I could only meet one set of needs at a time, but this summer is so much fun because we can all go out and interact/play together. This really is a sweet time. It's still busy, but not hard like the first year hard. We are in a good spot and so thankful for that. I had someone ask me last week if I was ready for summer to be over, and I'm not. I do love Fall and it will be great when it arrives, but this will also bring a marked change to our family too because Norah will be starting preschool. I know it's only two mornings a week, but it's a big deal. She is excited and we know it will be good for her, but since Norah was born, I've stayed home with her. For two years and four months exactly (until Lucy and Ellory were born), it was just me and her together during our days. To have her not be here will be an adjustment for us all. It will be good, but still an adjustment. 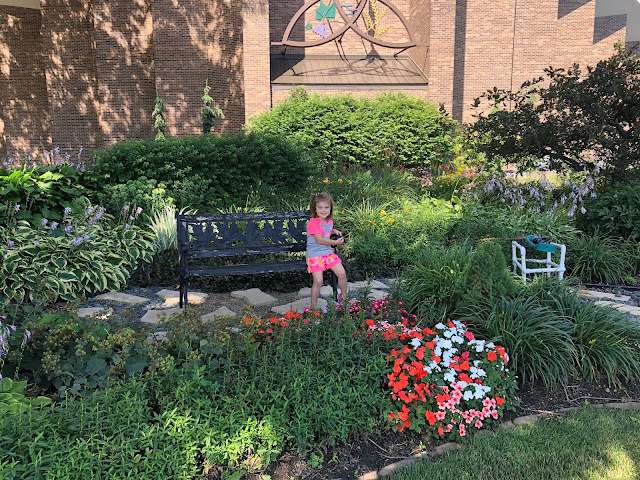 We pass by the church building where her preschool will meet at often on our way to the park, and Norah comments excitedly that that's where she will go to preschool every time. My first baby will soon be spreading her wings and leaving the nest a little, but my mom heart is glad it's only for a short bit and then she can come right back! I took this picture the other night when Kley was out mowing and Norah went out to ride her bike. 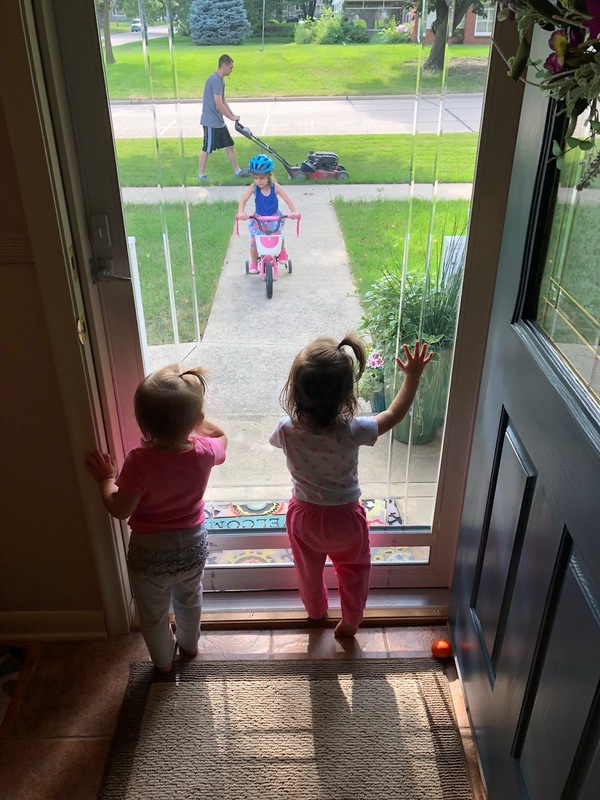 Lucy and Ellory liked watching them out the window while I made supper, yet they also desperately wanted to be big enough to go out too. All of my girls are growing up so, yet still need Kley and I too. Norah's going to preschool soon, yet still calls out for me in the night when she wakes up to go to the bathroom. She's learning how to write her name, yet she still comes running to me when she stubs her toe. She's starting to practice riding her bike without training wheels, yet still needs me to help put her doll's shirt on because she can't quite get the arms in right. Lucy and Ellory are walking everywhere, yet still need help getting down the garage steps. They want to be independent, yet still need so much supervision. They are saying new words often, but I still love their baby babbles. There are many balances, but today I am resting content in the in-between. I love that my girls are growing, but so happy that they still need me so much. Thankful for this beautiful summer season. They will keep growing and never stop, but today I'm glad Norah still needs me to help buckle her helmet and that Lucy and Ellory keep wiping smeared fingerprints all over the window no matter how many times I clean it. Motherhood is such a gift. These are the days. What a sweet post!!! Yay for variety of summers! Thanks! Enjoying this sweet season, and thankful we can encourage each other as friends no matter the season! Lucy and Ellory- Eighteen Months. Alexandria vacation with the Schuts- part 2. Alexandria vacation with the Schuts- part 1.